The reading from Colossians just provided provides an apt description of virtues, good habits we strive to foster in our common life as members of a Benedictine community. The reading reminds us that we are God’s chosen ones. God’s chosen one…Sister Jeanette was God’s chosen one. She knew God’s call to follow Christ in a particular way that is, to follow Christ according to the Rule of St. Benedict. She was called to live the common life under a prioress who, according to St. Benedict, takes the place of Christ. Sister Jeanette was called as God’s beloved, called to be holy. Sister Jeanette’s faith was quite simple. My observation was that she tried to live what she believed. Recently I read that an older sister was asked if she thinks a lot about death. Her response was, “I don’t think about death, I think about living.” I imagine that would be Sister Jeanette’s response to that question. Living is what Sister Jeanette did best! She found delight in many simple things each day. Reading the Bismarck Tribune from front page to last page, including sports and especially the comics (and, by the way, Pickles was her favorite comic strip). If a particular comic strip struck her, she might clip it and give it to someone else, even mailing it to someone who could enjoy it. Her sense of humor was unique and her smile was radiant when she shared a time of laughter. Sister Jeanette’s approach to life was simple and straight forward. I remember her occasionally preparing a simple evening meal for us who lived with her or graciously, simply greeting her friends at St. Mary’s parish. She loved the pastors and people of St. Mary’s parish. Each day simply held God’s goodness and blessing for her. St. Benedict urges his followers to seek God. Sister Jeanette found God in her life in community. Sister Jeanette was very proud of her parents and frequently mentioned that her mother was English, born in England. She treasured her closest family members: James, her only brother, and Hilaria, his wife and their family, her nieces and nephews. She was very close to her only sister, Sister Millicent and missed her intensely after her death. Sister Jeanette learned to enjoy music as a child; music was always a part of her life. When she became a member of Annunciation Priory/monastery, her love of music extended to the classroom where she assisted many children and young people to rejoice in God’s gift of music and song. As a young sister, she was organist as well as classroom teacher in different parishes in the Bismarck diocese. Through her teaching and participation in our common prayer, she sang psalms, hymns and spiritual songs with joyful thanksgiving. She was grateful for her relationship with her cousins. Carol and Lisa, we are grateful you are here to share our farewell to Sister Jeanette. She often spoke of her cousin, Fr. David Schwinghamer, his parents and his brother. Sister Jeanette found God’s blessing and goodness in her faithful friends who brought her great delight. She was particularly fond of gathering with the parishoners at St. Mary’s parish for coffee and rolls after Mass. And many times sharing coffee at McDonald’s after that. Her friends from the symphony orchestra stood by her, supported her, encouraged her. This was most noticeable when her hearing began to fail and her physical strength slowly diminished. Her desire to continue to be involved with the Bismarck-Mandan Symphony gave her energy to be there for practice and performance. She joined three special friends who gathered regularly to play violin and enjoy the sound of music as a string quartet. In our community, Sister Jeanette was faithful to our common prayer. At times she was organist for our prayer together. She delighted in knowing God was present and among us, especially in our time together at prayer. Gathered in prayer with the other sisters of community, she let the Word of Christ dwell in her, form and shape her life as a Benedictine sister. She came to our prayer with humility and devotion, expressing a commitment to God and love of God. This came from the depth of her commitment to God. Sister Jeanette loved her life as a Sister of St. Benedict. She would be the first to say that it was not always easy and free of disappointment and discouragement. 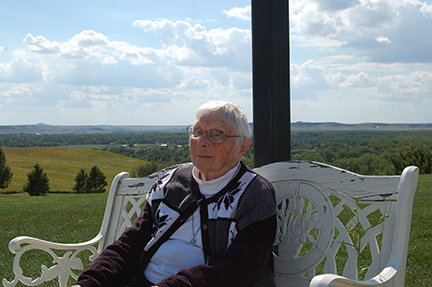 Sister Jeanette’s life and living reflect Christ’s love for her and God’s love in choosing her as beloved daughter. My experience of living with Sister Jeanette was that, in spite of hardships and difficulties, especially in the last years, she remained steadfast in her joy and delight in living. When she struggled in the last days at St. Alexius, I was with her one afternoon to pray with her. I sang several hymns and she had this wonderful smile. Then she raised her hand as if to conduct my singing. I think she found my rhythm was not the way she would have wanted it. She just smiled!! It was a wonderful moment. In the words of St. Paul to the Colossians: in Jesus’ name she gave thanks to God the Father. She came to Annunciation Monastery to seek God and that she did faithfully and lovingly, delighting in the presence of the God who chose her.